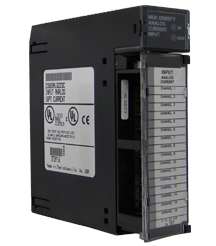 A 16-Channel Analog Voltage Input module, the GE Fanuc 90-30 IC693ALG223 provides up to 16 single-ended with each capable of converting an analog input signal to a digital value for use as required by your application. The default range on the GE Fanuc 90-30 IC693ALG223 is 4 to 20 mA with user data scaled so that 4 mA corresponds to a count of 0 and 20 mA corresponds to a count of 32000. The GE Fanuc 90-30 IC693ALG223 consumes 120 mA from the 5V bus on the PLC backplane and also requires 65 mA plus current loop current(s) from a user supplied +24V supply. To learn more about the Series 90-30 Family, click here. CIMTEC Automation has millions of dollars of New and Remanufactured Parts in Inventory, plus a full offering of Engineering Services such as Programming, Application Design and turn-key Project Management.